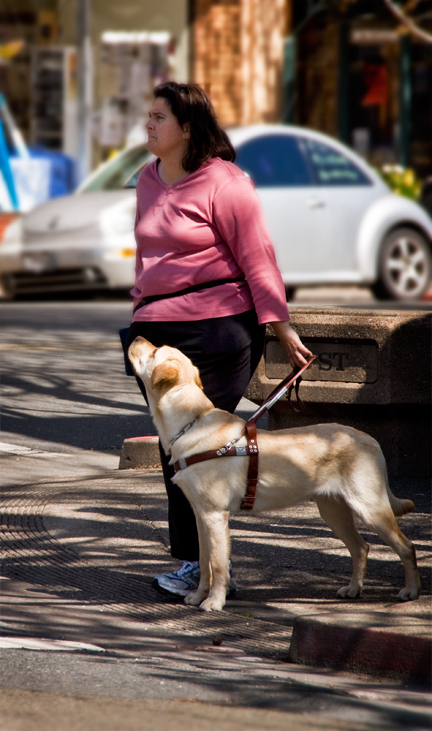 On any given day you may see dozens of guide dogs being trained on the streets of San Rafael. 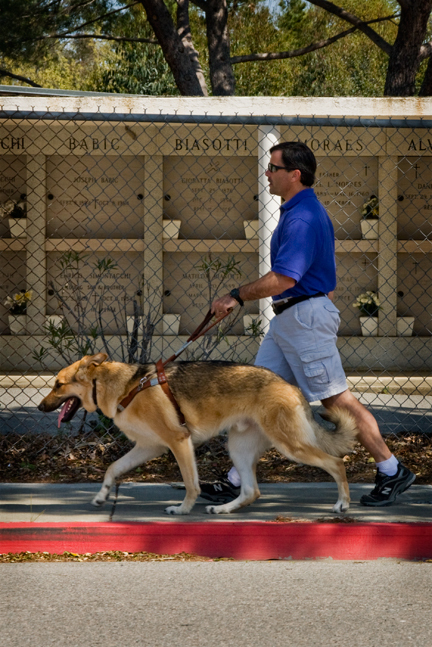 That city is home to the national headquarters of Guide Dogs for the Blind. The program currently has over 2,000 guide dog teams in service, their campus houses about 150 breeding dogs and whelps about 850 puppies annually. The organization is assisted by over 1,400 local volunteers who help raise and socialize the puppies in their homes, prior to training. The dogs are primarily Labrador Retrievers, but also include some Golden Retrievers, German Shepherds, and Retriever crossbreeds. Not all the dogs go into service assisting the blind, some enter search and rescue programs while others are sent to groups like 'Dogs for Diabetics.' Those dogs who don't don't become service dogs are quickly adopted from a waiting list of local residents looking for a well-behaved, well-trained family pet. This helps explain why nearly every car and SUV in Marin County seems to have a happy Retriever sitting in it. Another well-known Marin dog program is Pen Pals, a dog training group administered by the Marin Humane Society and undertaken by inmates at San Quentin. In the program, each dog is cared for and trained by two inmates for a four week period. The successful program allows specially selected inmates how to teach fundamental commands and help the dogs overcome special problems before they return to MHS to enter the adoption cycle.